My Dad’s life journey has ended and he is finally at peace. He left us on Sunday, August 2, at the age of 76. I’ve heard it said that what matters in life is the “dash” between our birth and death dates (his were 1/16/39 – 8/2/15, by the way). Dad did a lot with his “dash”, and as I reflect, I’m utterly amazed at not just his accomplishments in life, but also his failed attempts. I was fortunate to have so many years to observe both. He was born in Madison and grew up on the east side of town. My grandparents were blue collar workers, and could come across as cold and standoffish. My Aunt Charlotte was a nurturing surrogate mother figure to Dad, being a number of years older, but she bolted to freedom the minute she was old enough to leave. Dad was left with an alcoholic father, and as a result attached himself to his grandmother and uncle for adult support. Both proved to be better role models and Dad loved and admired them throughout their lives. Later as Dad moved into adulthood he quietly searched for the family and friends he didn’t really have during childhood. Dad married Mom shortly after turning 18 in 1957, in the midst of an Army stint that included stops in Washington state and Korea to guard the 30th Parallel between the north and south. Army life lasted almost three years and in that span both of my older brothers were born. After Dad returned from the service he turned his attention toward providing for the family. Sometimes this required overtime, a second job, or finding another way to put food on the table (such as catching fish). He did whatever the situation required. My parents and older brothers moved a few times before I was born, and then settled just a couple miles from where my Mom lives today. Dad had a series of what he called dead-end factory jobs, and wound up working in cement construction. As he learned the trade, he dreamed of starting his own business. Eventually the dream became reality as he went into partnership, buying equipment and hiring workers. Dad also wanted to have a place where his family could relax on the weekends with swimming and fishing being standard activities. He purchased land on the Fox River outside Montello and built a cottage. Some of my earliest little kid outdoor memories are from that property – a quiet slice of outdoor heaven on a dead end road. Unfortunately when I was about five years old the cottage was sold due to a fear of it being taken away. Dad’s business partner was running more of the financial side of their company while Dad supervised the employees. Running it into the ground is probably a more apt description of what Dad’s partner was actually doing. The bookkeeping was poor and they wound up in way over their heads with only one way out – bankruptcy. True to form, Dad was determined to start anew. In that era it was a bit easier to get a loan from a bank on name only. He also did his best to “make things right” with those who were owed money from the previous company. His acts of good faith served to strengthen relationships that only got better as time went on. The new business was smaller by choice, but wound up being successful until the late 1980’s when Dad ended it by choice. I started working for Dad’s construction company during summers in high school. While I also loved being outdoors, I wasn’t fan of the hard physical labor required. You could say I loved to play hard in sports like baseball and basketball – I just didn’t like to work hard. (Thankfully I grew out of that phase!) I felt something wasn’t clicking and that I was missing something, but I wasn’t sure what it could be. Dad knew I wasn’t happy and told me not to follow in his footsteps, and that something else was out there I would enjoy. He was right, and while it took some time, I did find my niche later on. I do admire and respect anyone working in the construction industry as the hours are long, and the work is draining. Many people like Dad get injured on the job and have to live with the effects for the remainder of their lives. Dad raised us to believe “all jobs are important” and “we all put our pants on one leg at a time.” These are values I’m glad he passed on to his children. Dad was a man of many interests besides his family and business. He often had outdoor hobbies throughout his life, and believed strongly about taking no more from nature than what was required, and to replenish resources. The power of education was a common thread as well – he always took the time to patiently teach others the finer points of any outdoor pursuit – even mushroom hunting. I think the solitude of being in a woods or by a stream was very important to Dad. As a result of his hobbies he got to know a lot of different people for many reasons. One time he went ice fishing and came back with a lifelong friend. Dad was just that way. He was a natural conversationalist that could talk your ear off about politics, world news, sports, history, or really just anything the other person wanted to discuss. We didn’t have everything in common of course, even though I tried all of his outdoorsman activities. The only one that resonated with me was fishing (probably due to the solitude). We spent a lot of time fishing for more different types of fish and in countless places (including Canada) than I can remember. I have many great stories of those adventures that could cover a separate blog post. Might be something to cast your direction (bad pun intended) on another day. The other sport we shared was baseball. Dad would proudly tell people “I’m a baseball nut!” I considered making him a T shirt with that saying, but thought it might take away from the way he emphasized those words. He took me to my first game when I was about nine years old – to Milwaukee’s County Stadium. The Brewers were becoming a good team then, and we shared many games together in the years following – both in person and on radio and TV. He stuck with the team whether they were great or downright embarrassing. Football was also fun for Dad to watch, yet his deepest enjoyment came from a baseball game. I now realize both baseball and fishing allow you to do a lot of talking and joking around. We’d talk baseball while fishing – especially when the fish weren’t biting! When a baseball game became one sided we’d sometimes talk fishing. My brothers had other things in common with Dad and I’m glad they did. They also brought a lot into his life with their interests. But our bonds were baseball and fishing, and I will always treasure those memories. One such memory involves that first trip to County Stadium. Dad wanted to get the best tickets available, and never having been there before, he didn’t have a lot of information to draw from in deciding what seats to purchase. He wound up getting seats in the Mezzanine section, which was a set of metal wrap around boxes that separated the lower deck from the upper deck. The mezzanine was kind of like private opera box seats – only in a baseball stadium. We were behind home plate and the view of the action was fantastic! Unfortunately our great happiness and fun began and ended there because it was April, and those early season games in County Stadium could be brutal in terms of weather. So we were stuck in a metal box with a howling wind off Lake Michigan in our faces. I don’t remember how many hot chocolates we drank in vain trying to warm up, or how many times Dad said “Never again” to sitting in the Mezzanine. I do remember how much of a “fish tale” the Mezzanine story became as years passed. I’m pretty sure when we told others about that first game that Jack Frost and Frosty the Snowman were in the other seats next to us! We seemed to recall that at the end of the game an usher had to chisel us out so we could go home. Dad proudly became a “First Base – Lower Box Seat kind of guy” after that game. But I was glad to sit next to him at any game in any section – except that dreaded Mezzanine of course! One of my greatest joys was to finally get Dad to the Brewers Opening Day in 2007. Somehow after all the years and games we never had been to an opener. It turned out to be a nice weather day on the first base lower side, and the Brewers won easily. Ben Sheets threw a complete game two-hitter against the Dodgers – we couldn’t ask for anything better, honestly. It was just a great day that I will always look back on fondly. In the offseason prior to that game I got tickets to an insider event where fans could mingle with the players. We were told that photos could be taken with players, but no autographs were allowed. It was a mix between current Brewers players and some potential future stars. Dad already had an idea that young minor league pitcher Yovani Gallardo was going to be a big part of the Brewers future. When we got close to Yovani, I told Dad it was photo time. When I took the photo, Dad told Yovani something like he was looking forward to seeing him play for the team and that he was going to root for him to do well. It was another great moment and I do have to say that Dad followed through on what he said – in fact he probably should have been the director of the Yovani Gallardo fan club. Unfortunately Dad went through a lot of pain the last few years after suffering multiple strokes and being diagnosed with prostate and bone cancer. Mom recently documented many accidents and health issues over his 76 years. Some of those were close calls – an “inch this way or that way” and the accident would have been fatal. Other health issues forced him to rehab to return to a normal active life, and he did the work without complaints. I got the sense he accepted long ago that health issues were a part of his life for a reason. 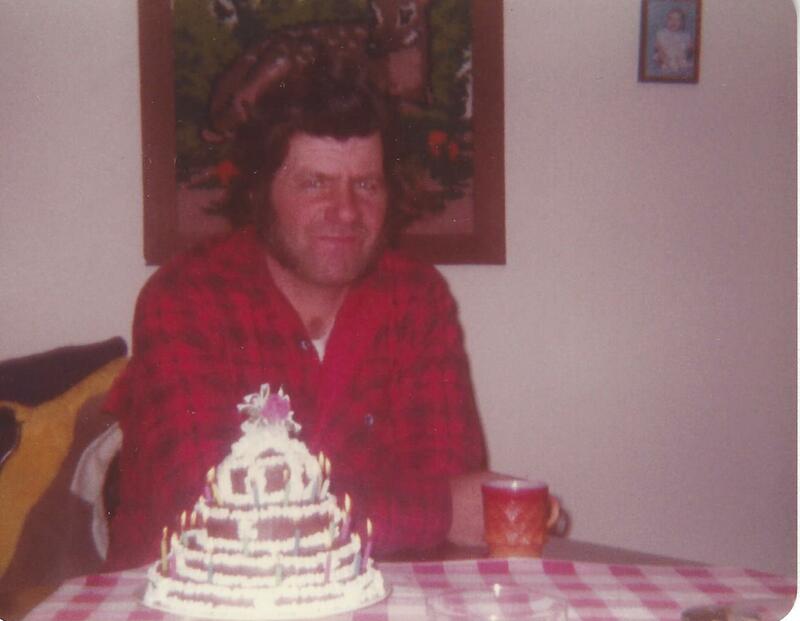 Dad on his birthday, 1982 – looking a lot like Wolverine from the X-Men movies! Thanks Toni! I’m glad I was able to inspire you. I hope to read about your Dad someday. I think the hardest part when it came to writing this post was narrowing down what stories to share. Chris you have brought your Dad to LIFE with this blog! I just read it and I could see your memories. Your Dad was a great man. I really enjoyed meeting him at your wedding and reception. I’m glad he told you to find your own passion.